I got another inch (and a bit) more done on the Garnets in Granite socks—I love them more with each stitch. 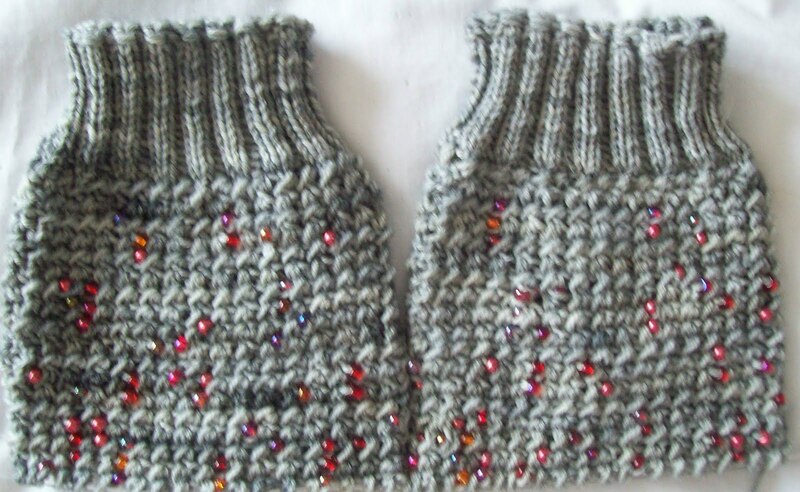 These could easily be tedious—but they aren't—they are supremely pleasurable to knit. I think I will finish them before the end of the month--(knitting will be so much faster after the heel)—there will be fewer beads on the instep, and none at all on the sole--which will be simpler knitting (and faster). Meanwhile, I got back to my color full cowl—Less then 1 inch of ribbing, yesteday AM is now more almost 4 inches. 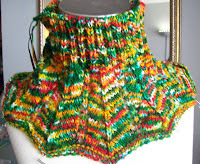 I didn't change needles when I started the ribbing—So its very soft and doesn't draw in too much. 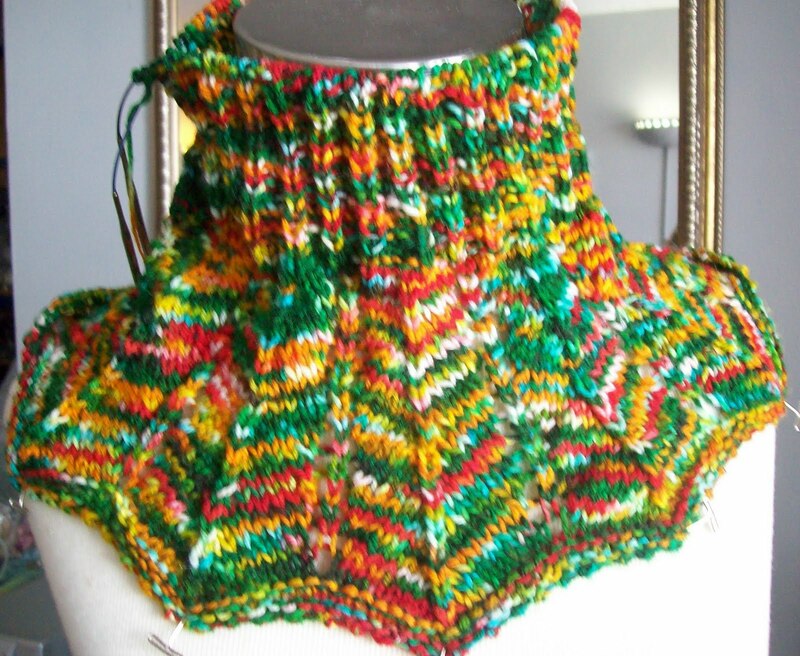 I don't like things tight (or even gently snug) around my neck –so I don't want tight ribbing. My terrace still isn't completely cleared-- I still have 2 wall hung planters--(coming in today) and a small set of shelves (my spraying platform) and I am still spray painting. (1 last kitty litter can to paint!) It's number 5—and now all my waste cans look like square waste cans (and only vaguely resemble squarish kitty little buckets.) --no more labels to be seen. The windows have been washed and the floor sweep and scrubbed—so its not too shabby. Any day now, the scaffolding will appear—and the spray painting will come to an end. It's been nice weather—A bit windy—but the wind is from the south—and the terrace faces north by north west.. and is fairly protected—at least for now. This past winter, the storms that came out of Canada-- were so wicked strong—they nearly blew the door in—the small slide lock (for wind, since I am not much worried about anyone coming in from the terrace—the neighborhood is nice, but not rich enough for a cat bugler—14 stories is pretty high for slim pickings! ) is mounted in the wooden trim around the door--which was almost ripped of the door frame by the force of the wind! You must have a specific pair of shoes in mind for the beaded socks, otherwise wouldn't beads on the instep bother your feet? Maybe mine are just to sensitive. Cute cowl! There will only be a few beads on the upper part of the instep--I agree, going to low down (and inside a shoe) would be uncomfortable!